You may know that I love mascarpone cheese, and that the reason of my passion for Tiramisu, so it will be great to have another Tiramisu in my collection, in a cupcake form. This recipe is an adaptation from ................ have to say that the original recipe uses less Mascarpone cream (or not enough for me) but if you want to fell like having a cup of Tiramisu, lot of cream is in need. I don’t have Masala so I use Kahlua® instead (ok, I have to tell you I like Kahlua®, I can have it by its own, so it’s good to use any liqueur that you like to drink on you food). So now Tiramisu is in a form of cupcake, it’s easy to make, and more important, it’s easy to eat too. 3. Beat egg yolks with ½ cup of sugar until very thick and creamy. Gradually add coffee and Kahlua® or other brand coffee liqueur beating continually. 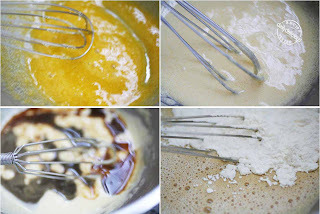 Gradually fold dry ingredients into mixture, using a whisk, set aside. 4. Beat egg whites with salt until they start to form moist peaks and gradually beat in remaining 1/4 cup sugar. Continue beating until egg whites are stiff but not dry. Stir 3 tablespoons of the whites into yolk mixture, gently fold in remaining whites. 5. Spoon batter into 12 cupcake papers, filling about 2/3 full. Bake for about 20 minutes or until a tester inserted into the center comes out clean. Remove from oven and cool. 4. 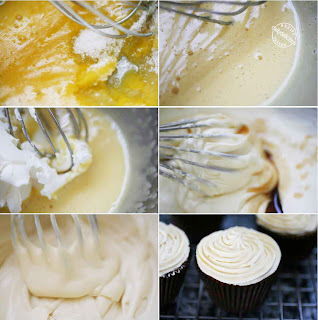 When cupcakes are cool, you can poke tops with a fork a few times and sprinkle a tablespoon of Kahlua® or other brand coffee liqueur over each cupcake. 7. To make the mascarpone cream: beat egg yolks with sugar until they are light and fluffy. Beat in Kahlua® or other brand coffee liqueur. Gradually add mascarpone, beating continually. 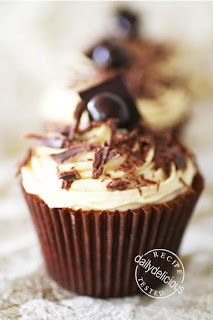 Pile cream on cupcakes, decorate with chocolate coated coffee bean and sprinkle with chocolate. hi,i would like to try your recipe:) but wondering if the flour need to be sifted? opps...one more qn.will the frosting melt easily?do i need to chill the cupcakes after frosting? First the flour need to be sifted and the frosting will melt easily in the hot weather, so chilling is better option. I made these cupcakes and they were divine! It only cooked for 10 min. When I saw in shop, how much fat is in mascarpone, I balked. So I used plain smooth cottage cheese - it wasn't a thick frosting, but very nice. I tried out ur recipe yesterday and it turns out good. Thanks for sharing ur recipe. hello..can u tell me 1 cup = how many g ? thanks. 1 cup is about 120-130g.